Darts Grand Slam is a Windows Store and a Windows Phone game where you play the very popular Darts game. 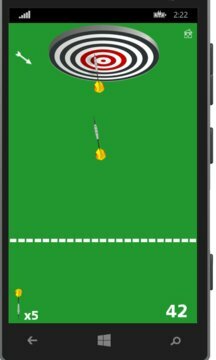 Hit the center of the target with all of the seven arrows and beat the record. Try to be accurate as legends like Eric Bristow, Phil Taylor, John Part, Eric Bristow, Raymond van Barneveld. Can be played by many players.